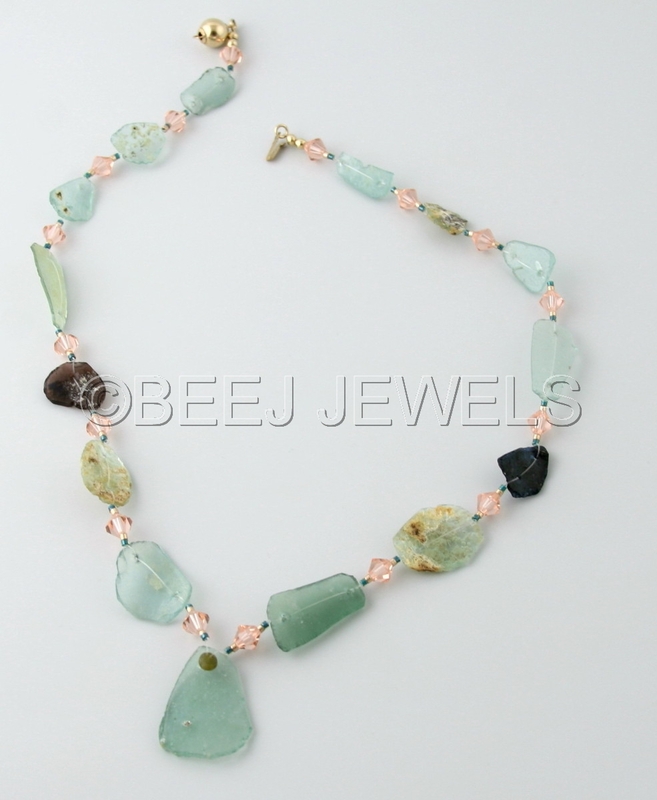 Necklace has 15 Roman Ancient Glass fragments. It is strung on Beadalon Supplemax Ultra monofilament illusion cord. Necklace is very lightweight and delicate. Other components include Swarovski Peach bicone crystals, Delica seed beads (Galvanized Apricot Gold and Dark Teal Shimmering Topaz) surrounding Peach crystals, and YGF round clasp. Overall length including clasp is 18”. These Roman Ancient Glass fragments most likely early 1st Century AD. Iron impurities have colored the glass aqua blue or light green. Fragments are thick so may have been hand poured as blown glass was much thinner. And may have been part of a water vessel carried by a servant, or a bottle that held perfume or medicine . . . or just imagine . . .
Roman glass can be cut and highly polished before being incorporated into jewelry. I prefer raw, natural pieces. These fragments are smooth yet have kept their weathered look - some appear to shimmer with color like a peacock's tail; others, at first glance, may look as if they are covered with patches of gold foil; or have a white chalky layer due to deterioration. None of these effects were deliberately produced by a glassworker. Instead they are the result from a gradual weathering that glass undergoes when it is buried for a long period in damp soil. A little background you may find interesting. . . The Roman Empire people used glass vessels in all shapes and sizes to store wine, medicine, perfumes, and food. During the 1st century AD, glass production in the Roman world drastically changed as the art of glass blowing was discovered and vessels for everyday use began to be made in aqua hues. Remains of many 2,000-year-old drinking glasses, vases, and jugs continue to be uncovered across the former Roman Empire, especially in Israel. It is believed the invention of glass occurred around 2200 B.C. in northwestern Iran. Chemistry for the coloration of glass was already in place during the reign of Tutankhamun in Egypt (circa 1330 B.C. ), and colored glass was heavily exploited for furniture and architectural inlay for several centuries thereafter. Although the Romans had nothing to do with the invention of glass, during the first century A.D. they did play a primary role in the industrialization of the glassmaking process in the Mediterranean world.